When you’re looking for direction in life, who better to provide it than the people you look up to? That’s why, when I first started writing online, I made a point of closely following the journeys of, and studying the words of, bloggers and writers whose work I admired. After doing this for a while, a pattern emerged. It seemed to take most bloggers 4-5 years to get good traction, and then, around the 7-8 year mark, that’s where they really cracked it. That’s where they achieved the level of reach I aspired to. Armed with this knowledge, I developed an eight-year plan for this blog. Yep, you heard that right. I have an eight-year plan, (one I’m about to enter the seventh year of). Despite having such a clear roadmap for where I was going, however, I spent a large chunk of 2015 and 2016 feeling very lost. I wasn’t connecting with readers at the level I wanted to. And I felt my writing had stagnated. It was a pretty frustrating time and the longer it went on, the more angsty I felt. Because I wasn’t quite connecting with my own blog’s audience in the way I wanted, my confidence was taking a hit. Luckily I had the opportunity to write for other audiences – Problogger, Copyblogger and Flying Solo to name a few. When my articles went well for those publications (two of my posts made Copyblogger’s ‘Best of’ list for 2016!) it gave my confidence a boost and showed it wasn’t my writing skills that had deserted me, it was my understanding of my audience. I nearly didn’t start podcasting in 2016. I wasn’t sure I wanted to endure the growing pains of learning a new skill and the week we needed to start recording coincided with me being knee deep in the (horribly messy) first draft of Practical Perfection. The timing was all wrong – but it was also really right. Podcasting presented an alternative outlet for sharing my ideas, and was also a medium that didn’t care if I had ‘all the answers’ before hitting Publish. Some of my favourite Let It Be episodes last year were ones where Brooke and I had no idea what we thought about a particular topic and had to figure it out along the way. When you’re feeling lost, it’s so easy to fall into the comparison trap. And I did. Worse, instead of comparing myself to people who were at the same level of development as me, I was comparing myself to people years ahead of me. I started looking for shortcuts that would help me catch up to them faster. In the end, I had to check myself; remind myself that those people whose ‘success’ I was aspiring to, they’d done the work. Why did I think I was so special that I should be able to achieve what they had without doing that same work? When you’re feeling lost, it’s very easy for perfectionism to kick in: “I won’t press Publish on something unless it’s amazing,” sounds really legitimate; like something the people you look up to would say. But it’s not legitimate. It’s a cop out. One I was very tempted to use. Luckily I’d been there, done that and gotten the t-shirt already. I knew that taking even the tiniest of steps forward was preferable to the stagnation of perfectionism. So, I kept pressing Publish, week after week. I got a good look at what wasn’t resonating with my audience. Which, in retrospect, was just as useful as knowing what did. I think this is ultimately what got me out of my funk. Towards the end of 2016 I started noticing when something hit a nerve with the people I wanted to talk to. An off-hand comment on a friend’s Facebook post got 15 ‘Likes’. That comment turned into my most shared post of the year. A thought shared on my Facebook page generated such a response, I knew I had to write more about it here. No matter what it is we’re aspiring to do in life, doing it well involves connecting deeply with people. Meeting those people where they are instead of forcing them to come to you? That might be the one thing that helps get your feet back on the ‘right’ path. 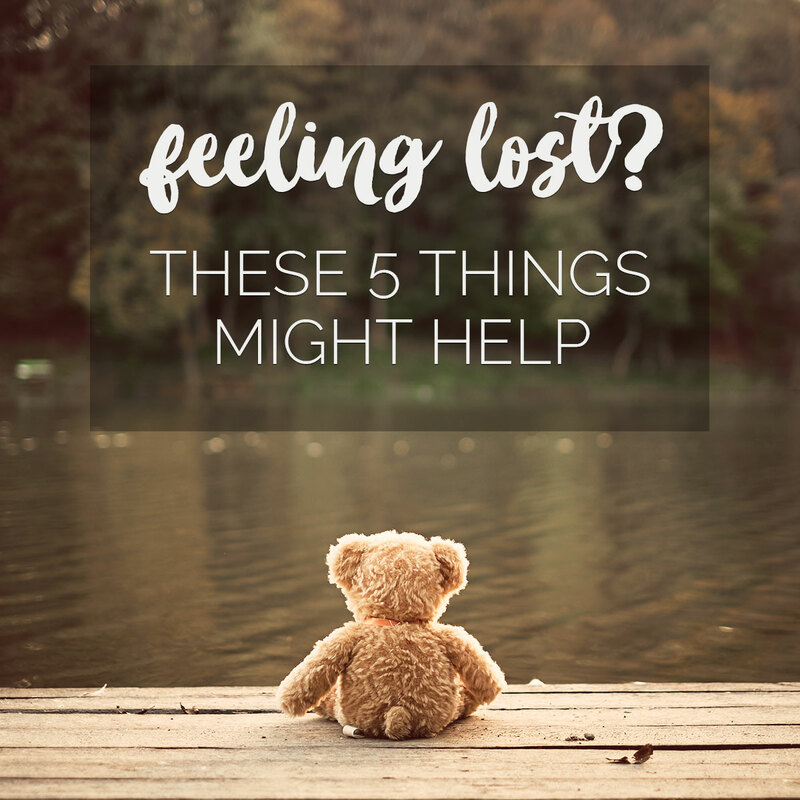 It’s possible to know exactly where you’re going, and still feel lost. It’s possible that the person who seems to have it ‘all going on’, is just as lost as you. The bigger the hurry we’re in, the more likely we are to come off the path (because we get a bit desperate). Trust yourself to get you where you want to go. And give yourself the space and time to do it. What if you don’t know where you’re going? My friend Kerri wrote this wonderful piece recently. It showed how none of us are locked into living one life anymore. We can all live several if we want to. If you don’t know where you’re going right now, it’s highly possible you’re transitioning to the next ‘life’. None of us have a single destiny. Life’s possibilities are infinite and any number of them can and will bring the contentment we seek. Again, trust in yourself is key to making that transition a smooth one.